London Bridge is one of the capital's best-known landmarks. Travis Elborough, author of London Bridge in America, takes a look at its history from the Romans to the Americans. even to this day, the origins of london remain much disputed, but the romans certainly established a settlement by the thames after having erected some kind of wooden bridge or pontoon to ford the river during their invasion in ad43. roman london was therefore a bridgehead settlement, with the whole of the city, in effect, starting as 'a parasite of london bridge', as the historian r. e. m. wheeler once rather emotively put it. various wooden bridges are documented to have spanned the river from present-day southwark to the city of london, but the first stone london bridge would have to wait until the twelfth century, when a local priest, peter de colechurch of st mary de colechurch, petitioned for its construction. composed of 19 irregular arches and a drawbridge, old london bridge took 33 years to complete and it is estimated that as many as 200 people died during its construction. peter de colechurch did not live to see it completed, but his remains were later interred in a chapel on the bridge dedicated to the martyred thomas becket, where pilgrims en route to canterbury could pay alms. old london bridge remained the only crossing over the thames as far as kingston until 1729 – and colechurch’s structure, albeit patched up, repaired and revamped many, many times, remained a fixture in the city for nearly six hundred years. the practise of exhibiting the severed heads of the likes of sir thomas more and jack cade on spikes on the southern gatehouse of london bridge began in 1305, with the scottish rebel william wallace. convicted of treason, wallace was hanged, drawn and quartered at smithfield before his beheading. 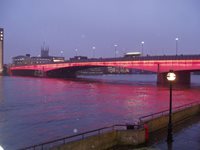 the last person to suffer this particular indignity was thomas sayley, a goldsmith executed for treason in 1678.
old london bridge was eventually replaced with a new neo-classical crossing designed by the great scottish engineer john rennie. opened in 1831 by king william iv, the new bridge, comprising of some 130,000 tons of granite, was then the heaviest thing ever erected in london. by the 1960s, it was calculated to be sinking into the mud of the thames at a rate of an eighth of an inch a year. in 1968, the corporation of london sold john rennie’s london bridge to the american businessman robert paxton mcculloch, who had it shipped to lake havasu city, arizona. the bridge was reassembled over dry land. only once it was finished was a part of the lake then diverted to flow under it. the current london bridge in london, meanwhile, was officially opened by the queen on 16th march 1973. having been completed in the autumn of 1972 and fully operational for some months already, the new bridge had to be closed to traffic for the opening ceremony.